The system is powered by a dual-core 4th generation Haswell 3.0 GHz Intel Core i7 processor. The 4th-gen Haswell processor uses low voltage for improved battery life without sacrificing performance. The MacBook Pro with Retina Display also has 16GB of onboard 1600 MHz DDR3L RAM, 256GB of PCIe-based flash storage and an SDXC media card slot. You'll be able to connect to the Internet with high-speed 802.11ac Wi-Fi. The MacBook Pro also supports a/b/g/n Wi-Fi networks as well. The MacBook Pro also features built-in Bluetooth 4.0, which allows you to connect wireless headphones, keyboard, mice and other compatible peripherals without a hassle. 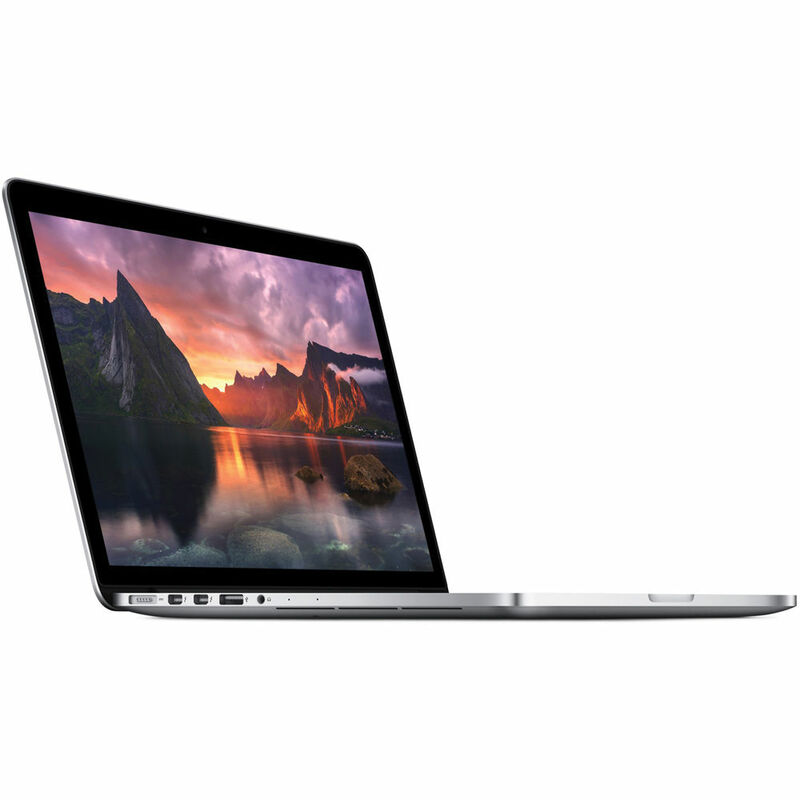 The 4th-gen Haswell Intel Core i7 processor with a state-of-the-art 22-nanometer single-die microarchitecture in this MacBook Pro provides fast dual-core performance. Intel Hyper-Threading technology allows two threads to run simultaneously on each core. The dual cores can run at a stock speed of 3.0 GHz. The processor can be overclocked up to 3.5 GHz, thanks to Intel Turbo Boost 2.0 technology. With a 4MB L3 cache and 16GB of onboard 1600 MHz DDR3L RAM memory, this MacBook Pro can run professional applications like Aperture and Final Cut Pro with ease. This MacBook Pro feels incredibly fluid and responsive. It's all thanks to its PCIe-based flash storage, which gives you up to 60 percent faster read and write performance than its predecessor. When you use apps like Final Cut Pro or Aperture, you can perform even the most demanding tasks right from your internal storage. And since this MacBook Pro comes with 256GB of flash storage, you can keep all your important files with you, including large video and photo libraries. Flash doesn't have any moving parts, which makes it reliable and quiet. And flash storage is extremely energy efficient, which means your MacBook Pro also has the ability to stay in standby mode for up to a month without having to be plugged in. Box Dimensions (LxWxH) 16.4 x 12.7 x 4.3"